This course consists of three workshops: two basic week-ends, which can also be attended independently, and a five-day advances workshop. The course has been held by Franco Santoro since 2004 as a one-week or two-week workshop at the Findhorn Foundation in Scotland. Traditionally held during the Holy Week, this is the 10th edition of this course, which this year takes place in the Community of Terra di Luce (Corvaro, Rieti, Italy). In this course we discover ways of employing our body to foster expanded states of consciousness, bridging our physical and multidimensional nature. Through shamanic practices, movements, dance, meditation, soul retrieval and energy work, we receive visions and insights, redeploying energy and passion in accordance with one's life purpose and the web of life. We also explore our shadow, sharing ways to explore denied and hidden parts of ourselves, release intense feelings, promoting forgiveness, transformation and unconditional love. 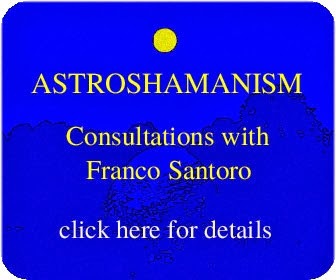 The workshops are a full introduction to AstroshamanicHealing Touch, a bodywork application of astroshamanism, developed by Franco Santoro since 1999. Its aim is to explore the physical perception of our bodies, unveiling and directing their healing potentials with integrity, spiritual alignment, and clarity of intention. We employ the body as a keyboard aimed at recovering and grounding planetary forces. With deep trance bodywork, awareness and astrological mapping we share ways of channelling profound passions, releasing blocks that hinder our potentials and celebrating the sacredness of life. Completion of the course provides a solid basis for advanced work, enabling participants to continue their practice autonomously, including the option of accessing our certification programme. Clear group agreements are held at all times to create a safe space. Participants set their own boundaries and do only what simultaneously honours both themselves and others. This course does not involve sexual touch or interaction. Open to participants of all sexual orientations. This workshop is designed to promote a gentle intimacy with your senses as gateways into your inner world and multidimensional nature. It is a basic introduction to AstroshamanicHealing Touch and its main healing applications. Through shamanic trance, energy work, soul retrieval and physical contact, we receive visions and insights, redeploying energy and passion in accordance with one's life purpose and the web of life. We explore the holistic and spiritual dynamics of sexual energy, as they are playfully portrayed by the astrological archetypes, aligning ourselves with the flow of life and opening up to new horizons of purpose and harmony. Open to all participants. During this five-day course participants will experience advanced applications of AstroshamanicHealing Touch. Drawing from the holistic wisdom of esoteric Christianity and astroshamanic practices, we will experience ways to realign with the sacredness of our nature, releasing wounds inherited by our ancestors and supporting the emergence of a planetary healing consciousness. We will learn various healing modalities in alignment with the astrological archetypes, developing trust both in giving and receiving. We will also experience the multidimensional features of relationships, employing techniques aimed at releasing grievances and intense feelings accumulated in our life, promoting forgiveness, transformation and unconditional love. The workshop is designed for people who intend to employ this work both for themselves and in their practice with others. The Basic Workshop is a prerequisite for attendance. During the following weekend participants to the whole course will have the opportunity to offer supervised sessions to new participants. This workshop aims at deepening and liberating the connection with the sacred nature of your passion, encompassing its spiritual and physical features. Through touch, sound, dance, shamanic walks and connection with the land, we will share ways of channeling profound passions, transforming and directing them in accordance with one's life purpose and the web of life. This workshop is also an astroshamanic exploration of the Christian Easter mysteries. Open to previous participants in Franco's workshops or sessions, or by interview.